Sharing borders with Powys and Shropshire, Herefordshire is a county of contrasts, from the idyllic Golden Valley to the rapids and gorges of the Wye Valley, via famous Black and White villages and the famous Cider Route. Our destination for this tour is the historic city of Hereford. 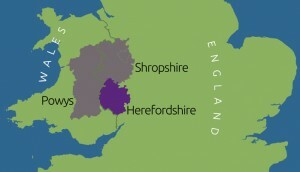 Hereford – the city that bears the name of the world-famous Herefordshire cattle. It is home to a magnificent cathedral, the longest surviving Chained Library in the world and the extraordinary Mappa Mundi, the largest known medieval map in existence. Herefordshire like other parts of the UK, has many cider orchards. The city has a small cider museum open every day except Sunday. After spending time in the city we return toward Wales on roads that take us through fields of orchards, some of which feed in to Bulmers, before enjoying views of other black and white villages: Eardisland, Kingsland and Pembridge, close to which is Dunkertons’ Organic Cider Mill.